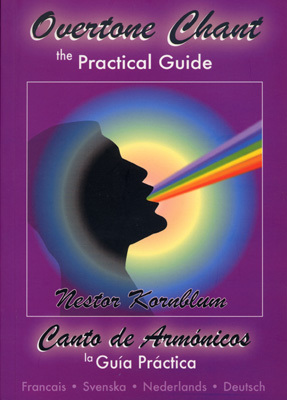 Nestor Kornblum's Overtone Chant – the Practical Guide, is a simple, efficient and extremely practical course in the basics of Overtone singing (Vocal Harmonics). The CD included in this book has clear, precise exercises, presented in a “sing along with me” format. There are also musical and meditative examples of Overtone chant performed by Nestor. The text, in six languages, is clear and concise, and will enable a dedicated beginner to reach a high level of overtone singing. "Vocal harmonics are extraordinary--they can open our ears, our minds and our hearts to a fuller spectrum of sound than we've ever experienced. They have great benefit as both therapeutic and transformational sounds. Nestor Kornblum is an excellent singer of vocal harmonics and a fine teacher of them as well!"